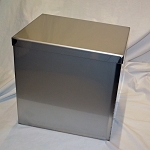 The capped cornerstone time capsule box is a basic stainless steel box time capsule. Its silicone sealing method is simple but effective and superior to any flat gasket made of any other rubber or foam. Why? Because it's superior for long lasting effectiveness. For time capsules, you want longevity - not performance under pressure. Customers can bury the capped time capsules for up to 75 years so long as their caps are oriented in upright position. No special vault is needed. Seal the area above where the time capsule is buried so that a minimum of water is allowed into where the time capsule is placed. Do not wrap it in plastic. Do not allow it to sit in water, and any water that comes in from above should drain away. Place it far enough down in the ground to take advantage of natural insulation. Ships promptly! 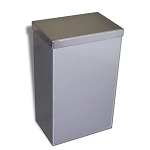 Time Capsule Box holds up to 125 or more documents, photos & artifacts safely. Ships promptly (1-2 days). 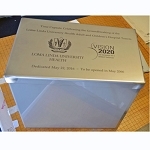 Time Capsule Box holds up to 200 or more documents, photos & artifacts safely. Ships promptly (1-2 days). Ships promptly! 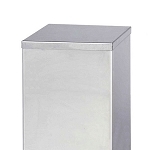 This time capsule box is a popular size for most projects, featuring the 18" height for longer items. Ships promptly! 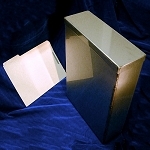 Time Capsule Box holds up to 325 or more documents, photos & artifacts safely. Ships promptly.